Located in the neighbourhood of a former printing works, the practice has used a printing block motif as the inspiration for the façade and interior design and give the scheme a striking detail that sets it apart from the neighbouring towers. 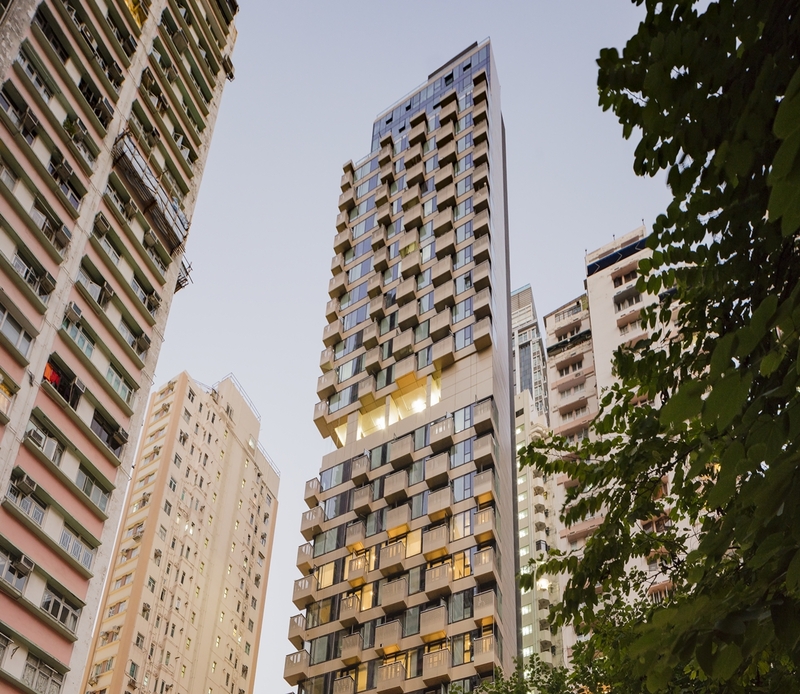 The slim 29* storey tower contains 105 high-end apartments, including one top-floor luxury penthouse and a resident club house. It sits above a dual height podium containing retail and restaurants. The practice was invited to compete for the interiors and façade design for an existing design, but quickly identified a number of ways to improve the efficiency of both the apartment layouts and the form of the tower itself. Make won the competition with an increased “holistic” role to design the façade and interiors, as well as the architecture and landscaping. Visible from The Mid-Levels, and located in a dense high rise urban area, the form and orientation of the tower has been carefully considered to prioritise views. In plan form, the scheme is now a slender square that provides triple-aspect views to the mountain and the harbour. Even the low-level apartments enjoy views of a new garden space that turns the club house area on the third floor into a relaxing space. There are three one-bedroom apartments and two studio apartments on a typical floor, three slightly larger corner units divided in between by a smaller studio. This layout wraps three corners of the building with the core on the fourth corner. Designed from inside-out as well as the outside-in, the layout maximises cross ventilation and creates a generous sense of light in each apartment. Every typical apartment has a balcony to provide external space—some have two. The history of the district has been expressed in the façade and balcony design. Both tower and podium are clad in champagne-gold, powder-coated aluminium rainscreen panels that gradually alternate between solid and perforated, meeting specific local planning requirements as well as providing changing views and interesting patterns of light and shadow. Balconies are staggered across all sides of the façade and provide solar shading as well as important outside space. Their square shape and gradually perforated motif reference the traditional printing blocks. Internally, Make has embraced the light and shadow and incorporated a rich palette that draws the eye to the full-height windows and stunning views out. Mid brown oak flooring flows throughout and dark engineered “Oak Noir” joinery is offset by pale walls and furniture, pale stone in the kitchen and bathrooms and champagne-bronze fixtures such as lamp shades and handles. Make curated the joinery and designed in as many features as possible to maximise space and a sense of luxury; bedside tables are integrated into the headboard and incorporate plug sockets and charger points and lights within the brown marble tops. Larger corner apartments include sliding doors between the sleeping and living space and include walk-in wardrobes. Bathrooms are clad in stone and are well lit with a rain shower, branded fittings and chrome fixtures, likewise all kitchens are fully fitted with all amenities and pick up on the light and dark theme with the Oak Noir cupboards and white worktops with chrome fixtures. Apartment entrance lobbies are dark with black marble flooring and textured wall paper, whilst the ground-floor lobby has Calacatta marble walls, matched with a monochrome flooring pattern that flows through to the residents club house and outside garden.